Motivational speaker and self-made multi-millionaire Lara Morgan flatly denies both women and start-ups in Derry the excuse that the odds are stacked against them when it comes to developing successful businesses. During a visit to Derry on International Women’s Day, when she was keynote speaker at a North West Regional College (NWRC) Enterprise Week event, Ms. Morgan’s message was clear: forget Brexit, forget borders, even forget glass ceilings, if you want to succeed in business you’re going to have to get over those hurdles. North West Regional College student Adam McCallion (Izonhow), and Niamh Gaffney, president of NWRC Student's Union, pictured with Lara Morgan when she spoke at the college on Wednesday as part of Enterprise Week 2017. She has some experience. Ms. Morgan established Pacific Direct Ltd. in 1991, when she was just 23. Under her stewardship it made and sold shampoo and soap to hotels internationally until she checked out her stake for £20m 17 years later. 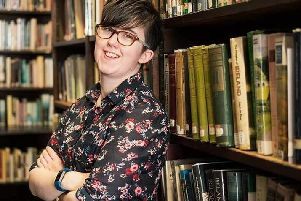 “I made a job as opposed to taking a job and that’s what we need to do in Northern Ireland, particularly in places like Derry, where people can be more creative and they can have the freedom to innovate,” she said. But what about the unique challenges present in peripheral economies like Derry? Substandard road and rail infrastructure? Patchy communications? “You may not like the answer that I don’t think there are any unique challenges anywhere in the world and, frankly, today you could start a business in a war zone...as long as you have the internet and technology and a desire to learn and grow. On the day that was in it, Ms. Morgan also issued a rallying call to women who may be contemplating setting up businesses in Derry. She accepts structural inequality persists within business culture and society in general but she wants women to take the matter into their own hands. “There are still massive issues with diversity on boards, there are massive issues with unequal pay and, actually, I think partly my ambition is to get more women to step up. “But, you know, I’m not biased, I think women need to shout out and be more demanding and demand more and, frankly, maybe blag it like the boys a bit, because that served me well. Following the session with Ms. Morgan, attendees were also given the opportunity to take part in break out workshops with Social Media Trainer Louise Brogan, Career Coach Dearbhla Kelly and Business Advisor with Bank of Ireland, Roisin O’Reilly. Ms. Morgan spent her afternoon at the college taking part in workshops with students.